Back like your favorite Christmas sweater! 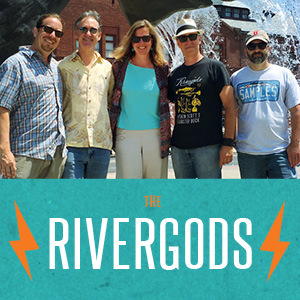 The Rivergods’ annual “that time of year” show returns Saturday, December 23! We’re delighted to be back at Daddy Jack’s, one of our favorite local rooms, and the big man Daddy Jack is sure be cooking up a holiday menu that will delight your senses. On our musical menu there will be great new songs we’ve been working on, some old favorites, special guests sitting in, and who knows, maybe even a holiday tune or two! Always a fun tradition for us. Make your reservations early at (860) 444-8888. More info here. Twenty stellar performers, one beautiful guitar. The 4th annual show to benefit the New London Homeless Hospitality Center will be Friday, Nov. 3 at Unity Hall, All Souls Unitarian Universalist Congregation New London. Tickets are $10 at the event. Doors open at 7; performances start at 7:30. Soft drinks, coffee, tea and desserts will be available for purchase. Sennheiser Electronics is donating of two sets of Momentum On-Ear Model Headphones which will be auctioned off the night of the concert… sweet!